When you hire Blue Haven’s Houston swimming pool-building team, you can have more than a beautiful pool design and backyard resort: You can take advantage of our exclusive high-tech options to create a fuss-free, water- and energy-efficient aquatic playground. Learn more about how our SmartFeatures® can save you time, money, and more! Along with the latest pool technology like remote controls and virtually chlorine-free purification, your new backyard playground can include other outdoor additions that enhance both the beauty of your home and your family’s lifestyle. Consider adding a fire pit, fireplace, pergola, gazebo, built-in island grill, complete outdoor kitchen, lattice patio cover, or pavilion/outdoor living room. And of course, as your full-project pool contractor, we can also build a deck to round out your new pool. Have a typical flat Houston backyard? We can create a multi-tier design with steps to give added dimension to your outdoor space. Choose from a range of materials, including colorful Sundek®, durable concrete pavers, distinctive travertine, natural flagstone, or stamped or decorative concrete. 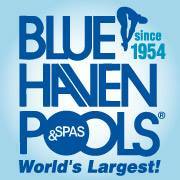 Are you the owner of Blue Haven Pools & Spas - Houston?